Behind the French Menu: Artichaut de Jérusalem or Topinambour - The Jerusalem Artichoke or Sunchoke on French Menus. Artichaut de Jérusalem or Topinambour - The Jerusalem Artichoke or Sunchoke on French Menus. Jerusalem artichokes ready for the chef. Photograph courtesy of Yael Beeri. The Jerusalem artichoke or sunchoke has no connection to other artichokes. The Jerusalem artichoke is a tuber. It is not related to the globe artichoke whose family includes the cardoon and thistles. 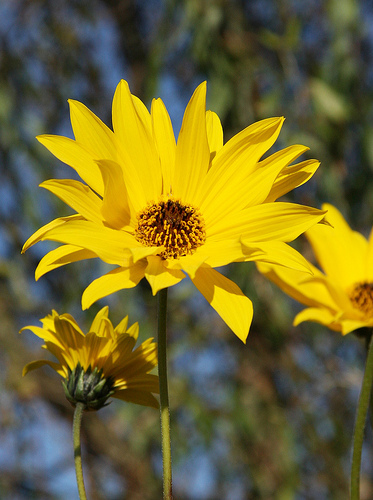 The Jerusalem artichoke or sunchoke is higher up the social ladder as it is related to the sunflower. We make pick the flowers, but the part we eat is the underground tuber. Raw it looks a bit like ginger root, to which it is not related. The taste of the Jerusalem artichoke. Uncooked Jerusalem artichokes have a crunchy, white flesh with a nutty, sweet flavor and are often part of a salad. 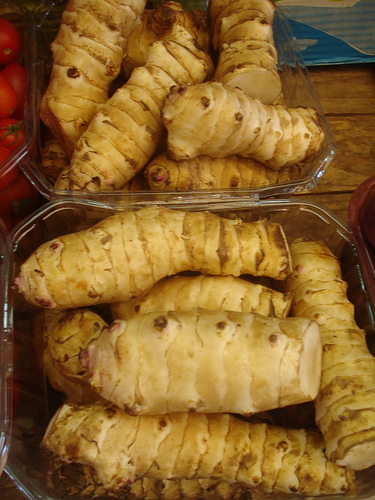 When cooked, Jerusalem artichokes make excellent soups and also may be served mashed or fried as a garnish. Painted by Claude Monet (1880). National Art Gallery Washington DC. Chapon Contisé de Truffes, Châtaignes et Artichauts de Jérusalem – A capon, that is a rooster, a cockerel, castrated as a chick and then fattened. Here the capon, the star of the show will weigh at least 2.50 kilos (5.50lbs). It is cooked with truffles, chestnuts, and the Jerusalem artichoke cut into small pieces and inserted into slits, contisé in French; so they add flavor as the capon cooks. Capons have tender meat and are usually roasted. You will be served part of the breast or portion of a leg; a capon is a large bird. Carré d'Agneau Rôti en Légère Croûte d'Ail, Artichauts de Jérusalem en Purée, Légumes Frais et Jus. A rack of lamb slowly roasted with a covering of garlic and accompanied by fresh vegetables and the natural cooking juices. A croute is a covering and a croûte d'ail, is a garlic flavored covering. The garlic will have been boiled to remove any heavy garlic taste. Then, before roasting the lamb is covered with a lightly flavored garlic covering made by combining mashed garlic with mashed potatoes or pastry. Filet de Rouget Barbet, Artichaut de Jérusalem - A filet of red mullet served with the Jerusalem artichoke. 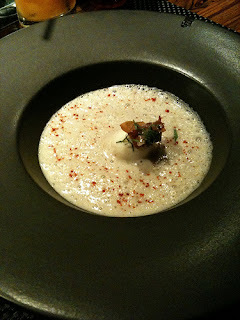 Jerusalem artichoke soup with mushrooms and a crouton. Mignon de Veau au Beurre de Thym Citron et sa Purée d'Artichauts de Jérusalem – Round cuts from a veal filet prepared with a lemon thyme herb butter and a puree of Jerusalem artichokes. Here the lemon thyme butter is served, as a condiment, on top of the fillet, and it will flavor the veal as it melts. N.B. : The French word mignon means cute and dainty and the term filet mignon is rarely used in France for beef. If it is used for veal, the menu will indicate veau, veal. A veal cutlet, escalope or scallop of veal would be an escalope de veau or paillard de veau. A filet mignon, just those two words together, without any other identification, in France, is a cut from a pork fillet. So, if you want a cut from a beef fillet or a veal fillet mignon in France make sure the menu clearly indicates your preference. The North American fillet mignon will be a filet de boeuf in French. The thick center of a beef fillet is saved for a tournedos, a Chateaubriand or a cœur de filet, the heart of the fillet. These different uses may cause confusion, but the French own the words “filet mignon” and so on its own filet mignon will be indicating a pork fillet. Photograph courtesy of Ewan Munro. Noix de Saint-Jacques de Plongée, Panais, Topinambours et Salsifis – The meat of the king scallop, collected by divers. 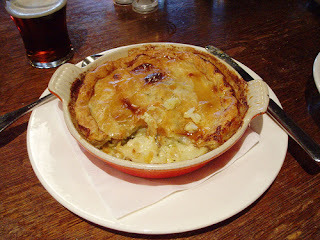 The scallop meat will have been very lighly fried and is served with parsnips, Jerusalem artichokes, and salsify. Diving for scallops saves the ocean floor. Fishing boats seeking scallops, use dredges that destroy the sea floor the source of food for many fish. The vegetable salsify is not well know outside mainland Europe, Salsify, also called the oyster plant is a root vegetable both cultivated and found growing wild near sea shores. There are two types of salsify, but they taste the same. At some point in time someone thought its texture or taste was like an oyster. I have enjoyed salsify and oysters separately on more than a few occasions, and I could not associate the texture or taste of salsify to oysters. Salsify's taste is somewhat similar to asparagus, and well-cooked its texture will be similar to other well-cooked root vegetables. In this menu listing, the scallops are identified as "Noix de Saint Jaques"; that indicates that only the meat of the scallop will be served. The scallop's attractive shell will not be part of the dish. 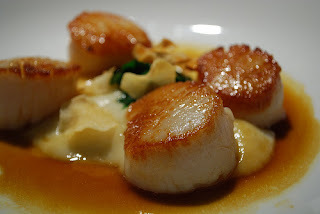 Scallop meat, Jerusalem artichoke and veal jus. Veloute de Panais et Topinambour – A velvety soup of parsnips and the Jerusalem artichoke. Where the Jerusalem artichoke originated. The Jerusalem artichoke originated in North America where it still grows wild. That is a long way from Jerusalem in the Middle East. The French colonists in Canada learned about these tubers from Native Americans and immediately began to cultivate them. They also sent plants back home to France. 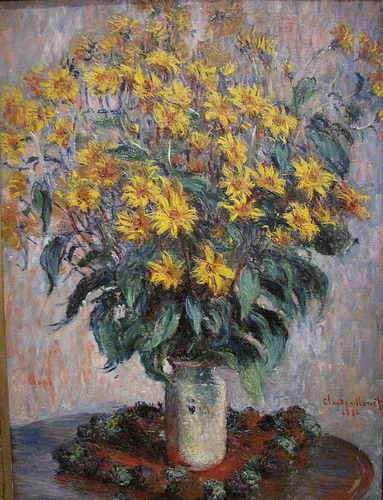 The Jerusalem artichoke is related to the sunflower, and when you see their flowers, you will make the connection. The flowers of the Jerusalem artichoke. The Artichauts de Jérusalem and Topinambour? How the French Canadian colonists turned this tuber into the Jerusalem artichoke is much disputed, the French blame the Italians; the Italians blame the French. The second name the French Canadians gave is Topinambor which is the name of a Brazilian tribe! When the French were introduced to this plant in the 17th century, there were would have been very few Italians walking around in Canada naming plants and no Brazilian tribes. There are stories that link the settlers’ use of the name artichoke to their letters home. There they compared the taste of the cooked tuber to an artichoke heart. However, that does not explain Jerusalem or that Brazilian tribe. There are other stories, but they seem rather farfetched, and I have not included them. The real stories behind the French names for this tuber remain a mystery, and whatever the reasoning behind the various names, this tuber is very tasty. (Catalan - pataca or patata de canya),(Dutch - topinamboer, knolzonnebloem of Jeruzalemartisjok), (German - topinambur), (Italian – tupinambur, patata del Canadà, carciofo di Gerusalemme), (Spanish - tupinambo, pataca). The Cardoon, in French the Cardon. A Vegetable That you May Not of Heard of. Thym, Serpolet or Farigoule - Thyme. One of the most important herbs in French cuisine. Veal in France II - Escalope de Veau or Paillard de Veau. A Veal Cutlet, Escalope, Escallop or Scallop.